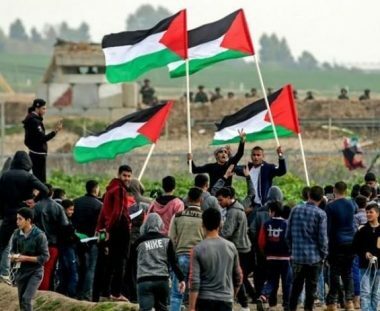 Palestinian medical sources have confirmed, Sunday, that Israeli soldiers shot at least eleven Palestinians with live fire, including one who suffered a serious injury, while dozens suffered the effects of teargas inhalation, after the army attacked protesters near the border fence, in the eastern part of the Gaza Strip. Five Palestinians were shot with live fire in Abu Safiyya area, east of Jabalia, in the northern part of the Gaza Strip, and were rushed to the Indonesian Hospital, in nearby Beit Lahia, while many others suffered the effects of teargas inhalation. One Palestinian was suffered a life-threatening injury, after an army sharpshooter shot him in the head, east of Khan Younis, in the southern part of the Gaza Strip. Furthermore, the soldiers also shot two young Palestinian men with live fire, east of the Zeitoun neighborhood, southeast of Gaza city. It is worth mentioning that the army has killed 16 Palestinians, and injured thousands, in the Gaza Strip since Friday, March 30th. Medical sources in Gaza said dozens, and possibly hundreds, of the wounded Palestinians could end up with permanent disabilities. Furthermore, the Israeli army said its soldiers arrested, on Sunday evening, three young Palestinian men who reportedly “attempted to cross the border fence,” and moved them to an integration facility.